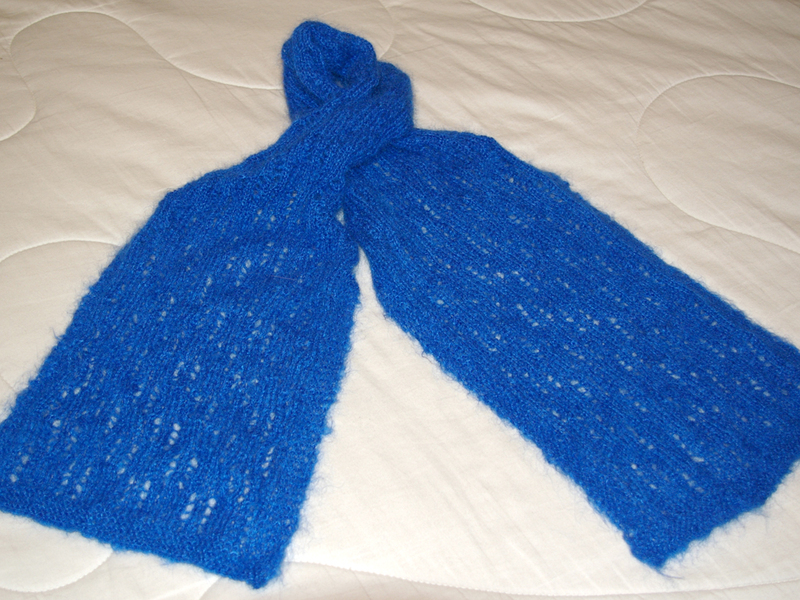 I’m designing a two way scarf and knitting as I go. I’m trying to use up odds and ends from my stash so I thought I’d put together this scarf. I’ll first show you my odds and ends: Estoy diseñando una bufanda tejida en direcciones opuestas. Intento usar hilos cachivaches de mi coleccion. Estas son los retales de hilos que tengo, una combinacion de ceda, lana, algodon, e hilos acrilicos. 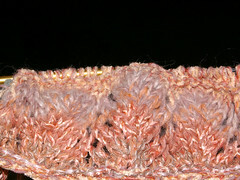 Using a size 6mm circular needle, I cast on 211 stitches (with scrap yarn) and then using the pattern from the scalloped feather lace that trims the Pink Mimosa sweater designed by Theresa Schabes in Interweave Knits, I knit about 5 inches (not in the round) in one direction. Then I’ve picked up the stitches near the scrap yarn cast on and I’m unravelling the scrapyarn cast on. 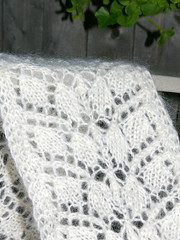 I will knit the same lace pattern for 5 inches in the opposite direction. 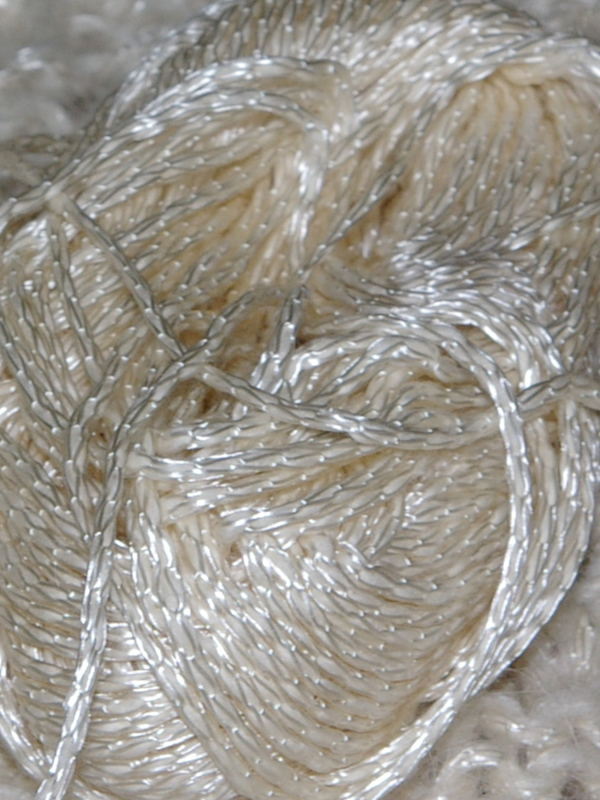 Usando una aguja de 6mm, monté 211 puntos (con hilo de resta) y usando las instrucciones para el calado ondulante que adorna el sueter de Theresa Schabes en Interweave Knits. Tejí como 12 cm en una direccion y luego deshice el hilo de resta con el cual habia montado los puntos originales y recogiendolos a la vez y tejí 12 cm en la direccion opuesta. I’ll post a better picture once it’s finished and blocked. Branching Out Scarf – Photo. 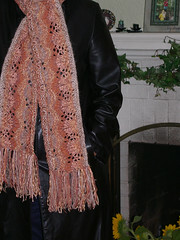 Here’s my version of the Branching Out Scarf by Knitty. 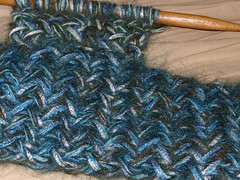 I’ve been working on Branching Out on knitty.com. 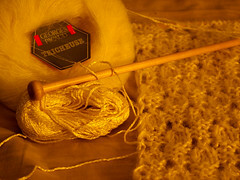 I found some Georges Picaud (remember him) mohair in my dated stash. It’s blocking right now with T-pins so I don’t have a photo of it yet. I think I’ll be focusing on scarves and lace work for the next while. 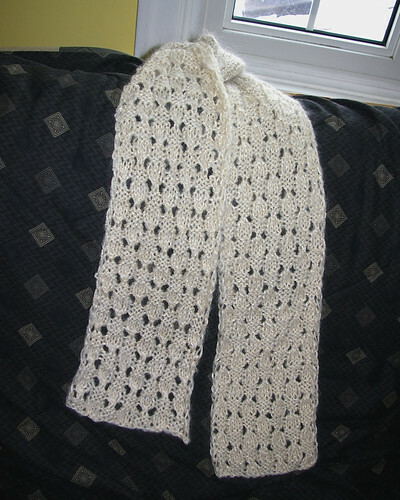 I have many christmas gifts to knit this year and I love the look of elegant lacy scarves. 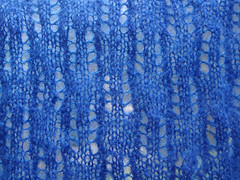 I’ve done one of those eyelash yarn things that knit up in a day, and it’s nice, but I’m enjoying the challenge of lace.